"Canadian and US National fiddle champion, Shane Cook captivates audiences with technically thrilling and adventurous performances. 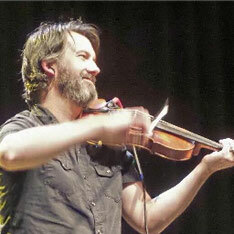 Cook has distinguished himself as a master of the Canadian old-time fiddle tradition and also excels at Irish, Scottish and Bluegrass. In concert, his expressive and virtually flawless performances place him in high demand among a variety of ensembles and collaborations that have seen him tour extensively in Canada, the US, the UK, Ireland, Germany, China and Taiwan." "Denny Breau's rhythmically flawless and dazzlingly clear style allows him to do amazing and stunning things with a six-string guitar. He first draws in an audience with a finely arranged melody and then slides effortlessly into scorching fingerwork that sets ears aflame. Lucky Clark has said that 'Denny is a consummate picker, evocative songwriter, and a singer with a voice that is warm and inviting but completely unpretentious.' He has long been in demand as a studio musician and has done jingles and sound tracks for radio and television as well as recorded and produced albums for other artists." Shana Aisenberg is a nationally recognized multi-instrumentalist, playing, composing, recording, and teaching diverse acoustic roots styles from traditional southern Appalachian and Celtic, to eastern European Klezmer, bottleneck blues and jazz. She has been a national flatpicking champion. Melissa Bragdon's interest lies in the fiddling styles of Celtic music and she has performed Irish music around New England and in Ireland. She is a member of the bluegrass band "Jerks of Grass" and has taught general music, beginning strings, and high school orchestra. Bruce adds strong jamming skills to the mix, plus he plays the elusive pedal steel guitar (lessons provided also). We let one electric instrument squeak in because he's Ellen’s brother! Darrell has been playing guitar and singing since he was nine years old. He started a band when he was twelve and his sister Ellen and brother Bruce joined in along with some neighborhood kids. Not only has he played with bands in Connecticut and New Hampshire, but he jams into the wee hours playing everything from country to rock to blues welcoming players of all levels. Alan was the founder of the modern day "Pittsburgh Mandolin Orchestra" in 2002 and has studied gypsy mandolin under the great Charley Rappaport. He lives in upstate New York and teaches many workshops on bluegrass jamming using the Wernick bluegrass jamming technique. Alan excels at helping students master fundamentals and techniques in a highly positive way. Paul Hubert has performed extensively as a solo artist on classical guitar and as a singer/songwriter. He is the guitarist extraordinaire with the NH-based band The Buskers, featuring tasteful fingerstyle guitar to blues-to-the-metal rock licks. He has produced three solo recordings and is featured on several other recordings and has an ongoing relationship with the New Hampshire Very Special Arts program. Bob is a member of the "Bluegrass Bureaux Cats" and can be seen playing with many people on the seacoast. Amanda Kowalski was the original bassist with the bluegrass band "Della Mae" and has been on many a national stage. In addition to playing fabulous bass she sings lead and harmony vocals and has taught at Augusta Heritage Center and other camps. Woody is both a musician and educator of old-time banjo, fiddle and mandolin. He is a performing artist with the NH Humanities Council "NH To Go" and Global Banjar, as well as a performing artist with the NH State Arts Council in Education. Steve Roy has toured on bass with bluegrass fiddler Laurie Lewis, Hit and Run Bluegrass and was a member of High Range. 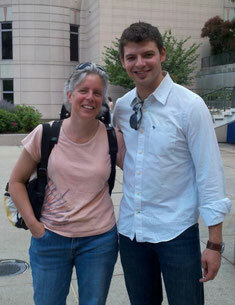 He currently plays with the Stowaways and Erica Brown and leads the bluegrass jam in Dover. Kathy plays fiddle and mandolin with the pop/folk/jazz band The Buskers and with northern NY jazz, folk and classical musicians in Yellow Moon and Northern Lights Orchestra. You can catch her performing across state lines, or maybe giving a workshop at a bluegrass festival or at the NYS Old Tyme Fiddlers' Association. David Surette is considered one of New England's finest guitarists, and has distinguished himself among North American Celtic guitarists by his use of Breton and French materials. He also plays mandolin and bouzouki. He is sought after as an accompanist in New England contra dance circles, recording with Rodney Miller, and is head of the folk department at the Concord Community Music School.